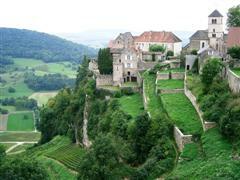 The Jura regions in eastern France is an area of rich contrasts. Our French guided walking holiday in the Jura as well as our self-guided Jura Wine Trail walking holiday explore these different regions by foot, discovering a region of gorges, vines and historic villages. This page provides some more information on the distinctive quality wines from the Jura. The wines from this region are grown in the Revermont, a band running north-south for 70km over a width of about 6km. The wine growing zone is characterised by steep slopes and cliffs and marks the geological break between the Bresse to the west and the Jura massif to the east. The vines grow on marl situated just below the limestone cliffs. In its heyday the Jura vines covered nearly 20,000 hectares. Today, however, it is one of the smallest wine regions in France at only 1850 hectares which represents only 0.2% of the French total. What it lacks in volume, however, it makes up for in its originality and quality. There are 5 varieties of grape in total including the Savagnin du Jura, unique to the Jura region which represents 15% of the vines and makes the famous Vin Jaune. The other varieties are the Chardonnay which comes from Burgundy and makes up 45% of all the vines. The Poulsard makes a delightful light and clear red wine, whilst the Trousseau is the rarest grape accounting for only 5% of grapes in the Jura. The Pinot Noir (the burgundy grape) completes the line-up, and is often combined with the Poulsard to produce a darker and more full bodied wine. The wine-makers of the Jura often make their wines out of a mix of several varieties of grape. 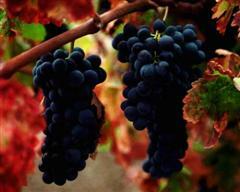 Different domains and villages also have there own specific climate and soil conditions giving rise to different tastes. In addition certain very specific wine making methods give rise to a number of wines with their own specific character and taste. There are 6 labels or AOC (appelation d'origin controllée) in the Jura, 4 relating to specific regions. These are the Château-Chalon, which covers a very small region and takes its name from the preserved historic village which sits on the top of a limestone outcrop. Only the Vins Jaune can have this label. The Côte du Jura covers a much larger area of 800 hectares and although it consists of all wine types, it is dominated by white chardonnay wines. The other area related labels are Arbois, named after the historic town and l'Etoile. Two labels relate to specific products; the Crémant du Jura and Macvin du Jura, a labelled liquor wine, which is made from two types of strong alcohol and a 12-month old non-fermented grape juice. There are a number of wines specific to the region, including the Vin Jaune – unique due to the grape variety and its long method of fabrication. It is kept in barrels for a minimum of 6 years and 3 months before it's bottled. 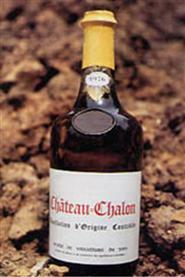 This wine is an aquired taste and is kept in unique bottles of 62cl. The Vin de Paille is a lovely aperetif drink and is specific due to the way the grapes are left to dry for several weeks on straw before being pressed. The Vin de Paille can be made from a variety of grape varieties and is bottled in half-bottles, ie 37.5cl.